After 20 years in the nursery industry, John McDonald is well aware of the crucial role biosecurity plays in keeping Australia pest and disease free. In December 2015, he was appointed as the National Biosecurity Manager by Nursery & Garden Industry Australia (NGIA) to lead the national nursery industry biosecurity program (NY15004). Mr McDonald is now at the frontline, working with governments and agencies as well as the industry to ensure production nurseries can continue to move and sell nursery stock across Australia. 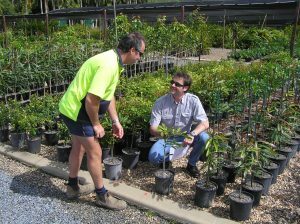 He has diplomas in plant protection, biosecurity, nursery and horticulture production, and started with Nursery & Garden Industry Queensland as an Industry Development Officer in 1996, then progressed to the Industry Development Manager role. Mr McDonald believes continuous investment in an efficient, robust and science-based biosecurity regime is critical, and ensuring the nursery industry has the capacity to minimise risks, and to respond effectively, is the driver behind his position. BioSecure HACCP is an on-farm, industry-developed biosecurity program supported by electronic documentation. Mr McDonald has worked with state governments to have it recognised as a national market access scheme, with legal authority to operate in Queensland, Victoria and Tasmania completed. Further work will see South Australia and New South Wales in place by mid-January 2017. The nursery industry has obligations under the Emergency Plant Pest Response Deed (EPPRD). Mr McDonald is a member of the national Consultative Committee on Emergency Plant Pests, which coordinates decisions on national responses to emergency plant pest incursions, and assesses it they will be eradicated using a cost/benefit analysis approach and technical feasibility considerations. Investment in research and development helps to address key biosecurity issues, enhance best management practices and build collaboration with industries who share a common goal. Part of Mr McDonald’s role is to ensure there’s awareness amongst the industry regarding the resources available. The Minor Use Permit (MUP) pesticide program allows for insecticides, fungicides, herbicides and plant growth regulators that do not have a legally approved label registration, to be applied in a nonregistered cropping system under an authorised permit from the Australian Pesticides and Veterinary Medicines Authority (APVMA). Mr McDonald’s role involves ongoing engagement with the regulators – both state and national – to help deliver modern pesticide chemistry to support on-farm management activities.